The One-Year Plan for completing the entire Geometry program is designed primarily for the high school student that is in need of acquiring credits as soon as possible. Step 1) The day starts with a Quiz over the previous lesson, if one is prescribed, with the instructor grading only the answers, and letting the student analyze the errors, in order to verify mastery, and receive partial credit. Step 2) The student then watches the new lesson, followed by the student “re-teaching” the lesson to the instructor, using the Course Notes. Step 3) The student demonstrates understanding, by working 5-10 Exercises in the WorkText. Step 4) The instructor checks only the answers, and requires the student to do error analysis, using the Solutions Manual. This procedure is repeated each day, allowing the student to cover the entire Geometry program, including Trigonometry in one year. The student receives two full credits for Geometry and Trigonometry/Pre-Calculus for this work. 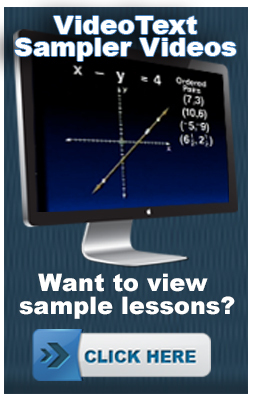 You receive Pre-Calculus credit when you cover Coordinate Geometry, (Units III, IV, and IX in the VideoText Algebra course) Exponential Logarithmic Functions (Unit X in the VideoText Algebra course) and Trigonometry.